C-sections (cesarean sections) involve making an incision in the abdomen to allow for the delivery of an infant from the uterus. 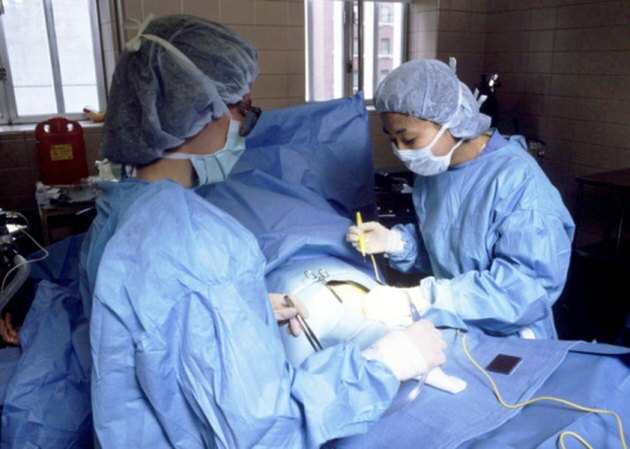 This surgical removal of the baby is performed when vaginal birth is not possible due to complications that could make a vaginal birth dangerous to the mother or child. Although C-sections are performed in sterile environments, there is still a risk for infection. One of the most common sites of infection following a C-section is the incision. Because the skin is host to a variety of bacteria, infection can set in. Infected incisions may become red, swollen and tender as the body activates the immune system to fight off the infection. The incision area may also ooze pus. In some cases, the infection may spread, causing red trail lines visible on the skin's surface leading away from the incision. A C-section can also cause internal tissues to become infected. One sign of an internal infection is the presence of fever. Patients may also develop a discharge from the wound that may be particularly foul smelling. If the kidneys or urinary tract are involved, urination may be difficult or painful, and the urine may be cloudy or have an unusual smell. Patients with an internal infection may feel pain in their abdomen and can also develop flu-like symptoms. Internal infections generally require treatment with antibiotics. One of the most dangerous kinds of infection following a C-section is called septicemia. Septicemia is the result of a bacterial infection that spreads to the bloodstream. Septicemia can cause a sudden spiking fever as well as rapid breathing, chills and rapid heart rate. Septicemia can progress to a condition known as septic shock, which is marked by low blood pressure, hypothermia, mental problems (such as confusion) and problems with blood clotting. Septicemia is a serious condition that requires immediate medical attention.